With a stay at Aria Apartments, you'll be centrally located in Broadbeach, just a 3-minute walk from The Oasis and 6 minutes by foot from Gold Coast Convention and Exhibition Centre. 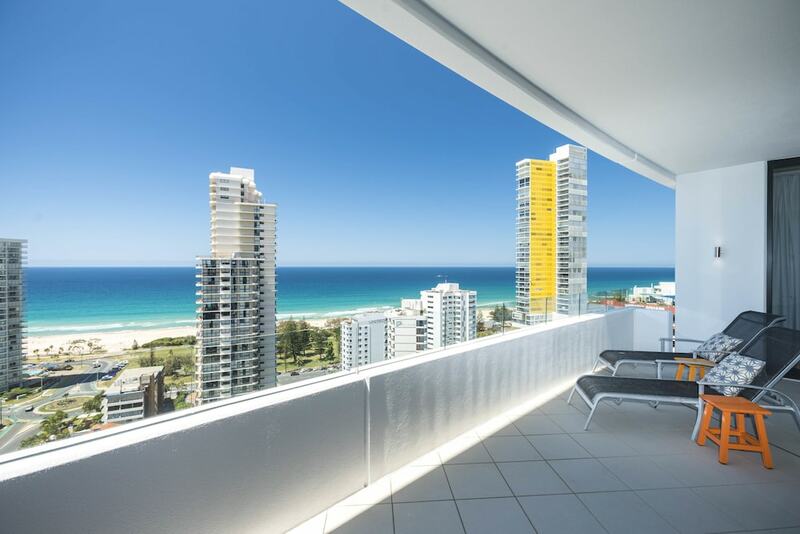 This 4-star apartment is 0.4 mi (0.7 km) from The Star Gold Coast and 0.3 mi (0.5 km) from Kurrawa Beach. Make yourself at home in one of the 36 air-conditioned rooms featuring kitchens with full-sized refrigerators/freezers and microwaves. Rooms have private balconies. Flat-screen televisions with satellite programming provide entertainment, while complimentary wireless Internet access keeps you connected. Conveniences include coffee/tea makers and washers/dryers, and housekeeping is provided weekly. Don't miss out on the many recreational opportunities, including a health club, an outdoor pool, and a spa tub. Additional amenities at this apartment include complimentary wireless Internet access, babysitting/childcare (surcharge), and tour/ticket assistance. Grab a bite to eat at one of the apartment's many dining establishments, which include 3 restaurants and 3 coffee shops/cafés. Need to unwind? Take a break with a tasty beverage at one of the 3 bars/lounges. Featured amenities include a business center, express check-out, and luggage storage. A roundtrip airport shuttle is provided for a surcharge during limited hours, and free self parking is available onsite. In addition to an outdoor pool, Aria Apartments provides a health club, a spa tub, and a sauna. Dining is available at one of the apartment's 3 restaurants and guests can grab coffee at one of the 3 coffee shops/cafés. Guests can unwind with a drink at one of the apartment's 3 bars/lounges. Public areas are equipped with complimentary wireless Internet access. This 4-star property offers access to a business center and a meeting room. This business-friendly apartment also offers tour/ticket assistance, barbecue grills, and a garden. For a surcharge, a roundtrip airport shuttle during limited hours is offered to guests. Onsite self parking is complimentary. Aria Apartments is a smoke-free property. Aria Apartments has 3 restaurants on site. Guests arriving after hours must provide credit card information and cardholder signature in advance to hold key. Upon arrival, guests will find instructions beside an intercom panel at the reception entrance. Further instructions will be provided from an after-hours service, which will allow entry and directions to a key and parking map. Guests are then required to go to the reception area the following morning between 9 AM – 11 AM to register and finalize any account details. Extra keys may be obtained at that time. This property offers transfers from the airport (surcharges may apply). Guests must contact the property with arrival details before travel, using the contact information on the booking confirmation. Parking height restrictions apply.